Why India does not need its poor?? Poor people are the victim of vicious cycle of poverty where causes and effects are so entangled with each other that it has become almost impossible to break it. Effects of poverty are such that they never occur alone; they are interrelated in a way that the task is difficult to deal with them. To name just a few hereditary plagues: no school or education, child labors to help their parents, lack of basic hygiene and transmission of diseases. Unemployment and very low incomes create an environment where kids can’t simply go to school resulting in increase in poverty and subsequently adding them to the vicious cycle of poverty. Social tensions are by-product of poverty which threatens to divide a whole nation predominantly due to income inequality. This can be seen when wealth in a country is poorly distributed among its population. For example it is observed in rich western countries that they are gradually losing their middle class, resulting to increase in number of riots and clashes among them. In a society, poverty is a very dangerous factor that can destabilize an entire country. The Arab Spring which started around end-2010 is another good example, in which the revolts started because of the lack of jobs and high poverty levels. This has led to most governments being overthrown. Poverty is not an absolute term but relative. People cannot be categorized as “poor”, they should never be considered as objects or discriminated against. It is poverty on which we need to focus and eradicate it. 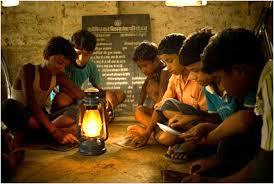 – India is estimated to have one-third of the world’s poor as stated by the World Bank. – According to the World Health Organization, in 2005 it was estimated that 700,000 people in India die from diarrhea each year. The lack of adequate sanitation, nutrition and safe water has significant negative health impacts. – 42 percent (456 million people) of India fall below the international poverty line which is $1.25 a day, according to a 2005 World Bank Estimate. – According to the New York Times, 42.5 percent of children in India suffer from chronic malnutrition. NREGA doesn’t only mean to pay poor without working; instead the main focus is to provide guaranteed employment for minimum 100 days per year. It is acting as one of the efforts to break the poverty cycle and bring poor people out of this cycle and make them self-dependent. In other sense also, NREGA or any such scheme is an effort to de-centralize urbanization all over the country and reduce burden from the cities. As resources of any city are limited and it can serve to a definite number of people; therefore, opportunities for employment must be created in rural areas as well. If India needs to grow, it needs to empower its poor with education and skills so that they can fulfill their basic requirements and contribute to national growth. Formally an entry for the InsideIIM B School Debate.